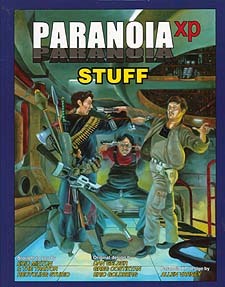 An astoundingly large Paranoia equipment book by Eric Minton and the Traitor Studio. Computer Phreak hackers bring you this giant 128-page collection of over 200 brand-new items from the Alpha Complex auction site C-Bay. Bid right now on weapons like the MonoBola, Gyro-Stabilizing All-Purpose Flux Fortifier, Gravitic Gauntlet (one size fits all) or the bot-brain equipped Smart Laser Barrel ('I don't care what you can see, that target is out of range! Stop being an idiot!'). Buy Threat Evaluation Eyewear, Surveillance Candy Treason-Free Speech Limiters, LubriSkates and Commie Traps. Then kick back with a can of Partee Tym Mildly Intoxicating Beverage and a copy of 101 Fun Songs to Sing in Line. So you don't forget, demonstrate your loyalty by buying all this essential STUFF today!